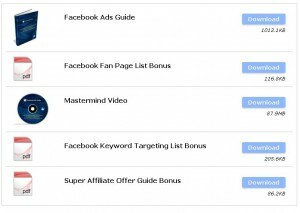 Facebook Ads Guide Review – Product by Jonathan Volk - $77 U.S.
Facebook Ads Guide Review (AffiliateInABox) – Ok, I actually went through this product, and there was some useful informatoin. If you have ever thought about paid advertising through facebook, then this product gives you a pretty good overview, and even includes a couple tips I hadn’t thought of. Jonathan Volk apparently has made over $1 million in commissions through facebook advertising. The product actually consists of several items, so you get a nice little bonus when you initially sign up. The first product, the ‘Facebook Ads Guide’, talks about how to match your ads to what people want, and how to effectively do ‘user profiling’. (That is, creating highly targeted ads to users so they notice them). He talks about when and how you should convert from CPC (cost per click) to CPM (cost per 1000 impressions), and how to maximize the number of clicks you get. It is mainly based on the type of ad images you use (not headline copy), and he provides examples. He talks about which affiliate networks to join to get products, and has some useful tips on 3rd party tools to use. Of course, naturally, some of them are affiliate links, but I suppose that is to be expected since he is an affiliate himself. (And one tool he recommends in particular is quite good for scaling up your facebook campaigns). So what do I think of this product? In a nutshell… Initially I probably would have found the $77 expensive for the product. But, when I received it, and realized there were a few hidden gems that I discovered that can mean the difference between a major loss and running a good profit, I would feel better. (There actually was one specific example that talked about targeting website demographics that I found useful). A top list of fan pages (again, good for market research, as well as an opportunity of knowing ‘whom’ to contact for additional advertising). As well, if you prefer video, he’s put together a set of videos (split up into small 5 minute segments), which is essentially an overview of his guide. 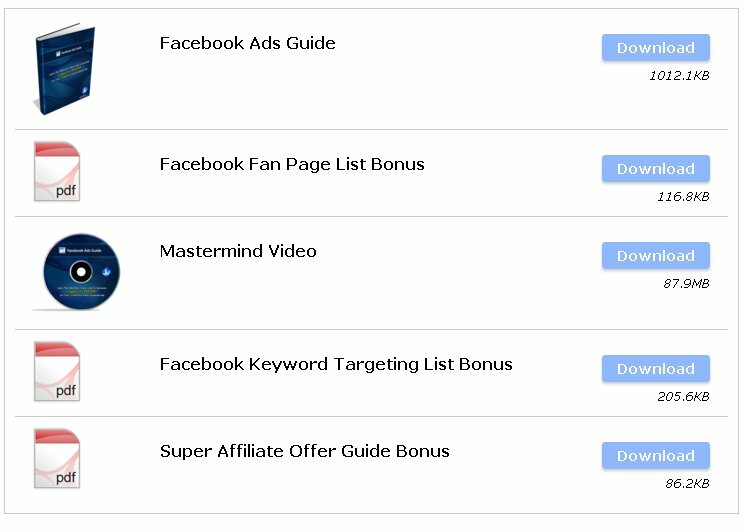 I would recommend this as a guide to someone who has at least an intermediate level of experience of affiliate marketing, or has at the very least tried their hand at facebook advertising. If you are brand new to affiliate marketing, you may find the material a bit overwhelming and may not be able to get the full use out of it. Overall, some good information. Click here if you’d like to get it.